Fernando and Carmelo Beloni represent the third generation of their family working in the fields of Brazil. They moved from Vargem Grande (São Paulo) to Patrocínio (Minas Gerais) in search of better growing conditions, and for the last 21 years have made lands mostly known for coffee support many other crops, as well. "We were attracted to the cerrado (a vast, tropical savanna) of Minas Gerais due to good climate, fertile soil and favorable terrain. Since it is an elevated area, it lets us plant some crops year round,” says Fernando. Fernando has a business administration degree, while Carmelo has a degree in agricultural engineering. The combination of each brother’s specialty has enabled AgroBeloni to excel. They are also quick to credit the examples their father and grandfather set for them, including diversity of crops. "Agriculture is our calling. It's in our blood," Fernando says. The family’s main crop in both locations has been potatoes. Now they plant potatoes on 700 hectares, but they also grow coffee, wheat, corn, onions, beans and soy, and tie cattle into an overall crop rotation and irrigation strategy. "We're always seeking information, and we found out that signal grass is the best option for rotation with potatoes. So we'll plan to graze cattle for two years in those areas,” Fernando explains. Dry conditions have made irrigation a critical investment in recent years. 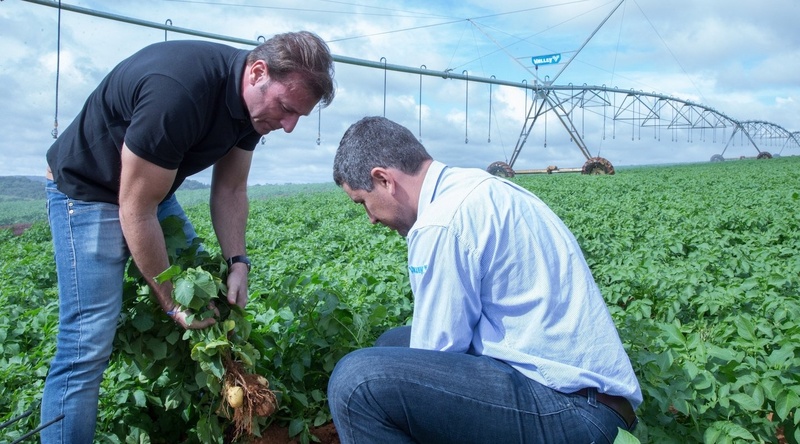 With their Valley pivots, growers in Brazil are able to cultivate certain crops year-round. 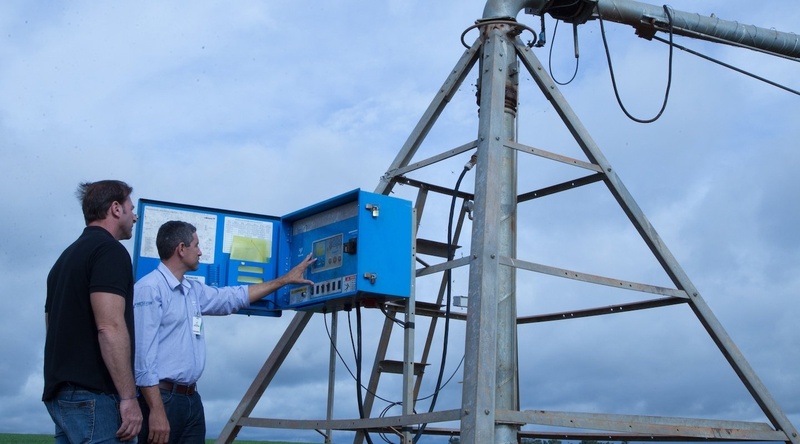 The Belonis have always invested in technology, and they were one of the first in Vargem Grande to implement center pivots in the 1980s. When the brothers came to Minas Gerais, they invested heavily in irrigation there, too. Currently, AgroBeloni is responsible for 5,500 hectares in properties located in four towns. In the dry wheat area, the Beloni family harvests an average of 2.5 to 3 tons per hectare. On the irrigated portion, the volume reaches 6 tons. Plus, the pivots make it possible to ensure year-round production of several crops. "Without irrigation, we're only able to cultivate some crops at certain times of the year. Potato is one of them. With the pivot, we are guaranteed 365 days of production. And, of course, that means profitability," he says. In the cerrado, it rarely rains from April to October. "During that period, if not irrigated, practically nothing can be done," he says. In a recent year, more than 70% of the corn harvest in the region was lost due to lack of "pre-winter" rains. However, those who had pivots and could apply water profited. The Belonis have seen a large increase in their yields since using pivot irrigation. They plan to add pivots as their business grows. Pivodrip, the Valley dealer in the region, assists the Beloni brothers. They have been in operation for 21 years. From their main office in Patos de Minas, they provide responsive service and quality products to 23 towns. The Belonis’ loyalty to Valley is evidenced by the more than 30 pivots they have. "Valley pivots are extremely durable, with nearly zero maintenance requirements. In addition, we've always received great technical support," Fernando says. Pivodrip’s technical manager, Cleiber dos Reis, says that demand for pivots has been growing in the region. "We observed that, mainly due to the dry conditions of the last few years, investment in irrigation is a necessity for food production. Those who install one always come to us afterward for a second and a third … they never stop irrigating,” he says. “After all, the farmer who wants to be successful invests in irrigation technology."